Heart Fires | Another crochet masterpiece in progress. I am well under way with following the pattern for Lucy’s Cosy Blanket. 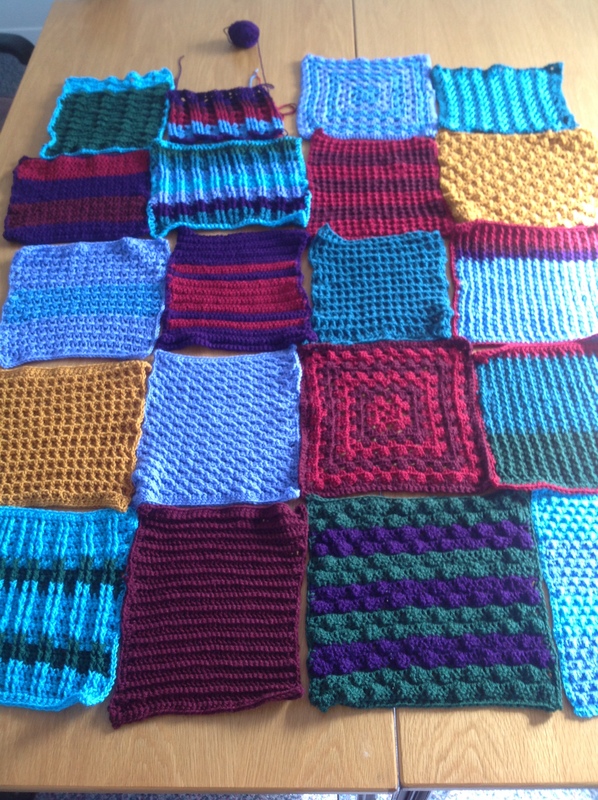 If you are following the crochet-along and using her colour list for each row then you will be aware that she posted the next section this morning. Here is the link if you missed it. Attic24 Cosy Blanket Part 2. So what mistakes have I done? Well, you know where you are supposed to check your width after the first row? Oops I forgot to do this. 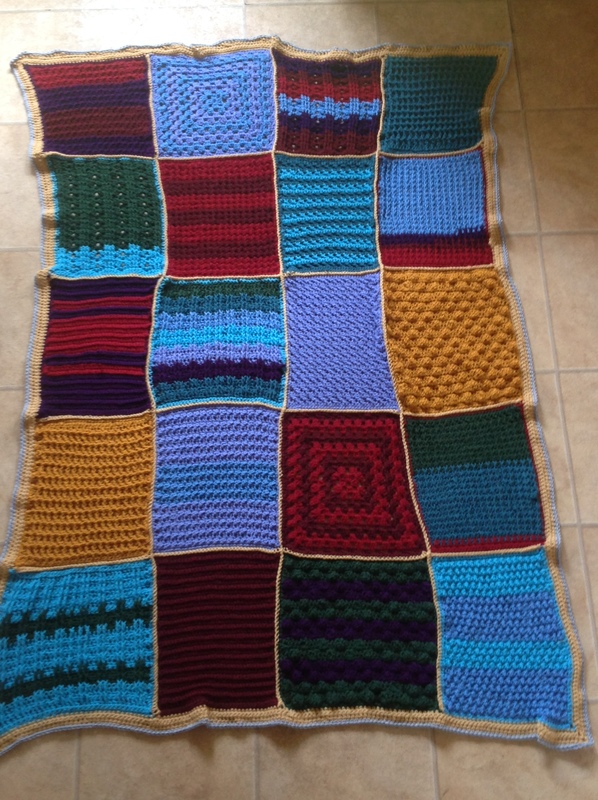 The wool supplied is for a blanket 120cm in width. Mine is 130cm. I guess somewhere in my future I am going to be ordering more wool! I am loving the colour selection. Lovely Autumn colours. My favourite. Ok who am I kidding, there is purple/pink coming up. /shudder Never fear I will persevere and close my eyes when doing those colours. My wrist is slightly sore today and my stitches (lime green) are not as tight as they should be as I compensate to reduce the pain. That too will add to the wool usage, but I am not a perfectionist (yet). Do you see what looks like bobbles in the picture? 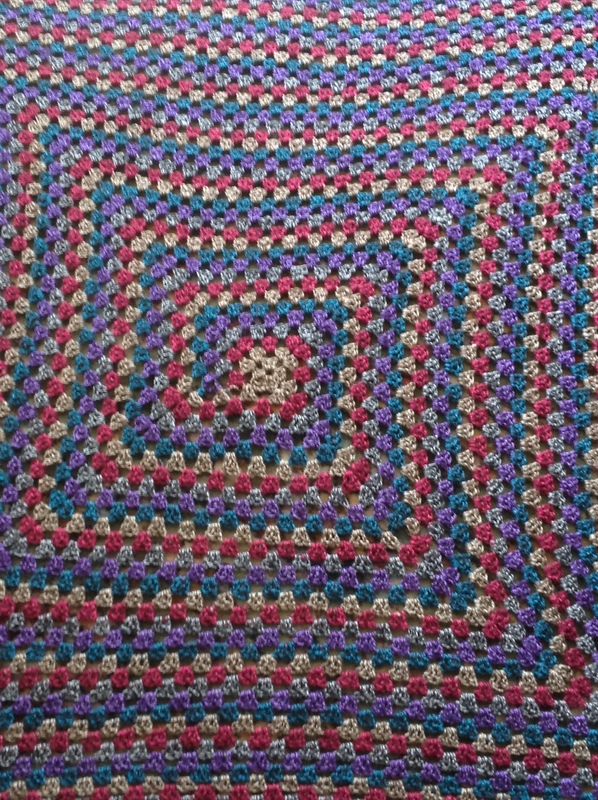 The whole blanket is done in the one stitch. Two rows of single stitches and two rows of clusters (three stiches). The bobble effect is an optical illusion caused by the angle the photo was taken. I was flicking through Facebook at the weekend seeing what everyone was up to an noticed that Lucy of Attic24 fame is running a step-by -step tutorial for making a Cosy Strip Blanket. Now if you ever see her work you will know that she uses the most beautiful colours that I frequently envy. Being of the most lazy mind set I was delighted to discover that the Woolwarehouse is selling a 15 x 100g ball pack of yarn for the Cosy Strip Blanket. Yippee no more buying wool in pretty colours that when you get them in the post do not look remotely similar to what you thought you were buying. I ordered Sunday and got the wool today (Tuesday). The wool is lovely and soft and has a slight shimmer to it. They even packed it into its own little storage bag so I can keep the wool together until required. 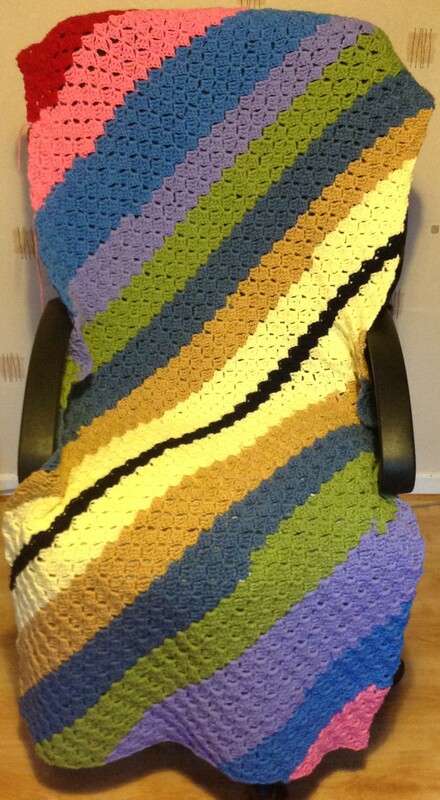 According to the note enclosed it will make a Attic24 Cosy Stripe Blanket measuring 120 cm x 180 cm. The size for a single bed. The step-by-step tutorial can be found at the Attic24 Weblog. 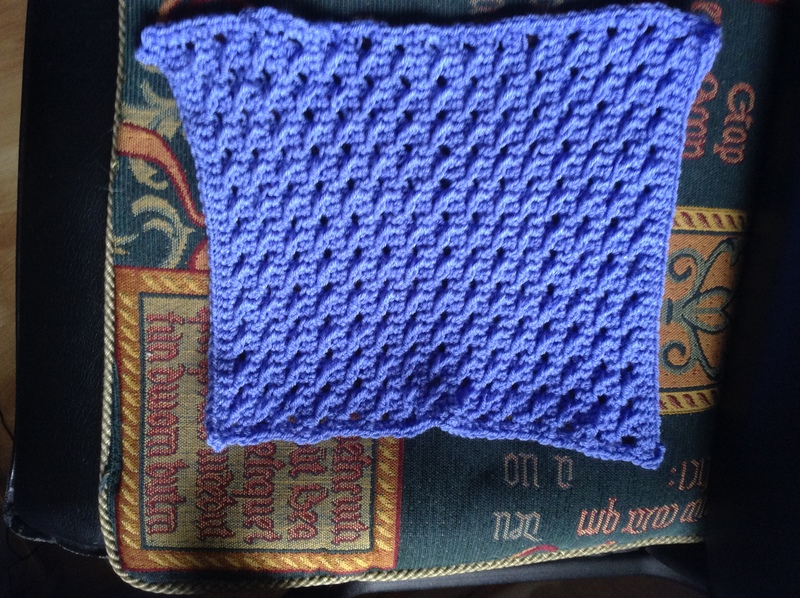 This could be a crochet-along as Lucy is updating her blog every Sunday thoughout November and December 2014 with her progress as she makes the blanket. I am just about to start the second colour. Looking good so far. This is a section of a Christmas gift I made for my brother. 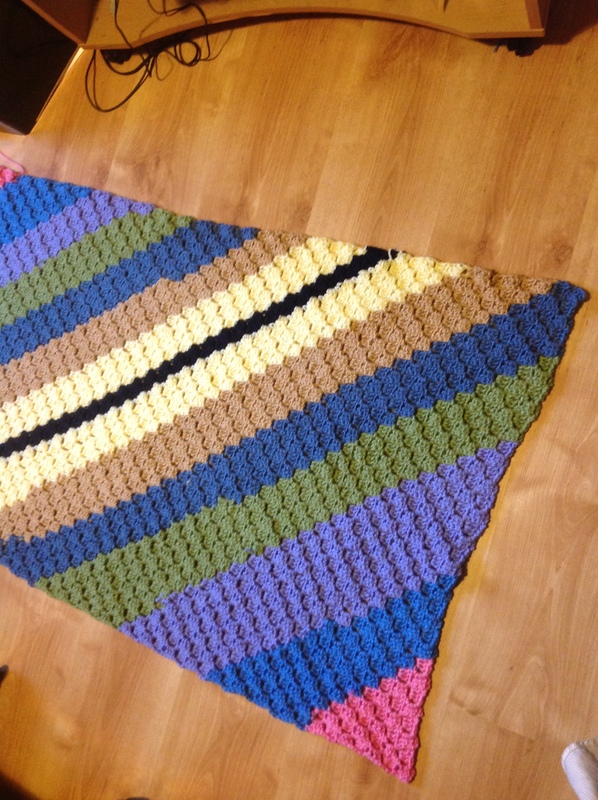 I used the Never Ending Granny Afghan pattern by Michael Sellick. Normally with granny squares you do one round and then change to a new ball of wool. I do not know about you, but I hate sewing all those ends in. Take another look at the picture. Do you see that I have used five balls of wool? Can you see that instead of a square the pattern is going in spirals? What happens is that after you do one round, you turn the afghan back to the start and pick up on the next colour. It is very quick and easy. If you like videos there is a link from the free ebook to a video tutorial. The next project I am just finishing is a corner to corner afghan. It is very quick to do and looks great. 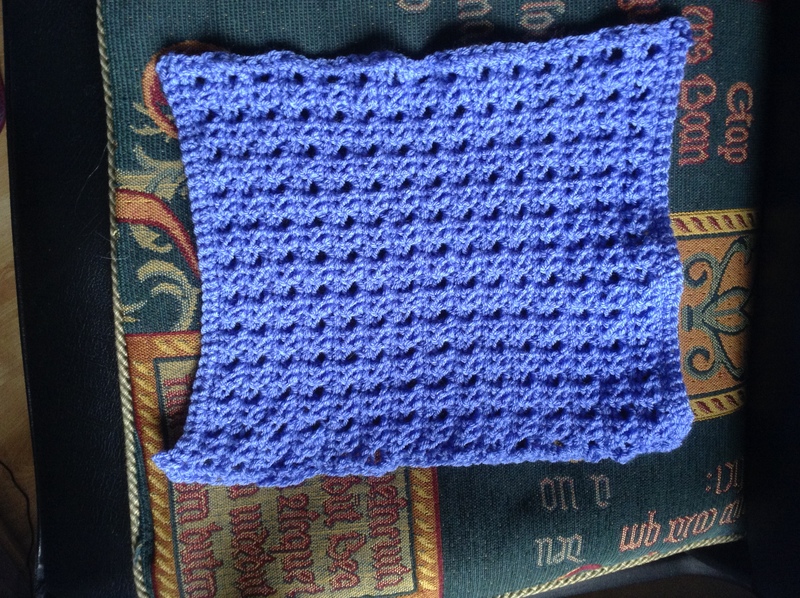 Each square is four stitches and you are crocheting into the end stitch when making the following square. 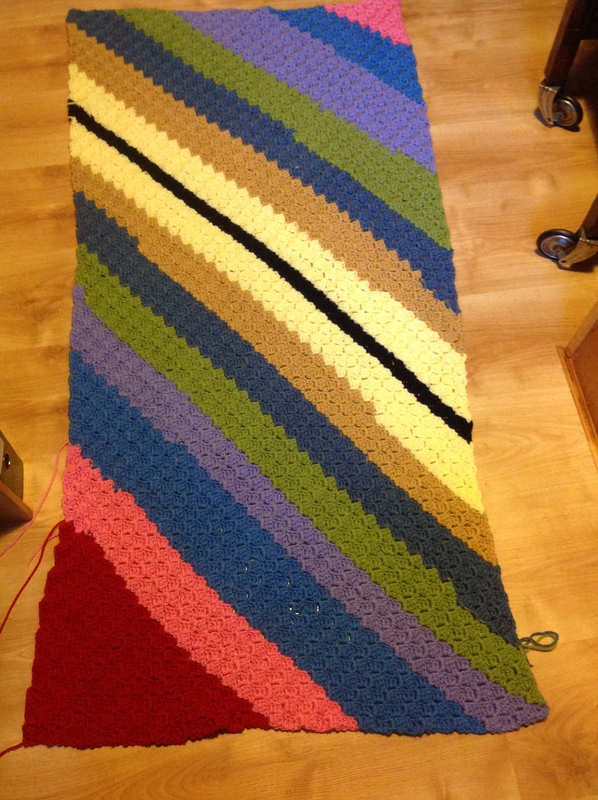 You start at one corner and increase each row until you have the width of the afghan you want. Then you only increase on one side of the afghan until you have the length you want. In this picture you can see that after the green stripe I started on the dark blue and decided that the project had reached width I wanted. To get the length I continued increasing on one side only. This created a corner on one side, but the bottom side keeps growing. 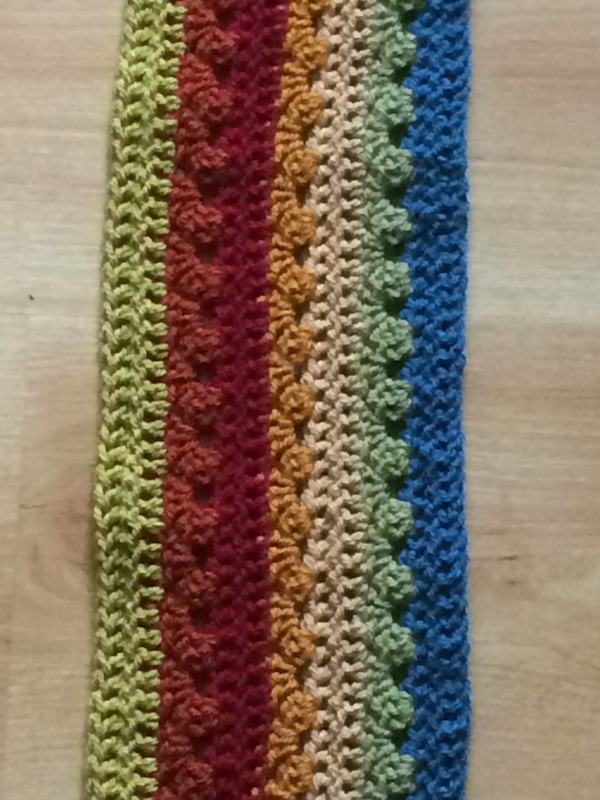 Once I have the desired length I stop increasing and as I am following a straight edge I actually start decreasing the length of the rows until I finish back in a corner. You can also just make out in the photo that you get a nice zig-zag when you change colours. I have tried to be random with the colour changes and thrifty with the yarn, but for a cleaner look you should change the colour at the end of the row. All that is left is to sew in the ends. This example is long and thin as I will be using it as a chair cover. So you probably want these links to the corner to corner pattern and perhaps a video from Red Heart.com? This pattern would look great on cushions. I am considering using up scrap wool to make a scarf this way. By the time the challenge period was coming to a close I was slightly pressed for time. There was a total of ten different patterns to create a square and a minimum of two of each square had to be in the project. Then the squares had to be sewn together … or did they? 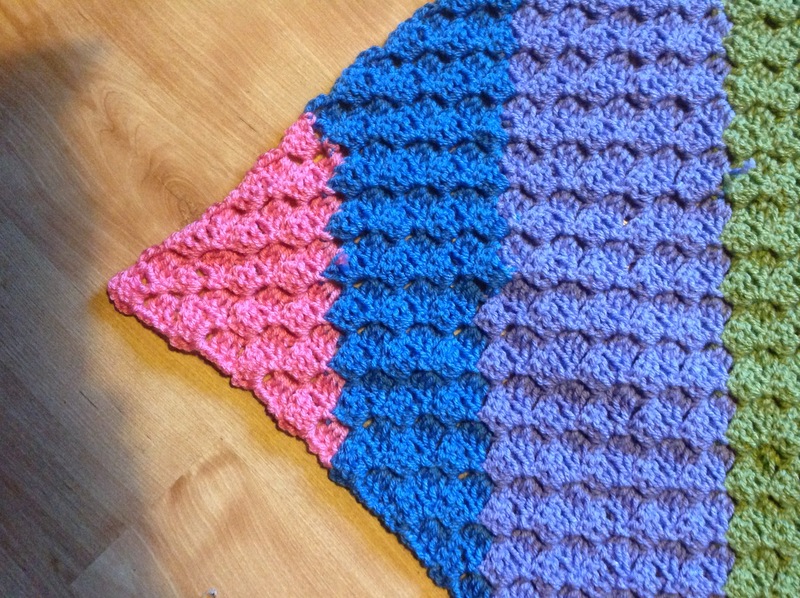 Did you know that you can crochet the squares together? Having some gold yarn left over from my squares I used these to create a raised edging around the squares which I find really sets off each square. Then came the border which had to have a minimum of four rounds. Running out of time and wool this was a challenge I could have done without. In the end I did a basic crochet border (and then later cried when I saw the beautiful way the other participants of the challenge finished theirs). So this is how mine finished up. It looks better in real life. As a relative newbie to the crocheting world I am delighted to have learned so many different patterns. I could not have done it without the accompanying videos and can say with hand on heart that I am no longer afraid to try out more advanced techniques. They may not turn out the way the pattern creator visualised, but at the end of the day I am one step closer to being a proper crocheting person. The workbook for the challenge is here. It has links to all the patterns and videos. Plus if you go to the Crochet Crowd website you can see all the entries to the challenge. See if you can spot my entry. Marvel at the adaptions to the free patterns that people made. This stich reminds me of a basket weave and it was so simple to do. All you are doing is working with either the front or back portion of the stitch below creating a raised area. The next stitch I have learned during the Crochet Crowds Stitch-cation Summer Challenge is the Cross Stitch. It is so easy to do. Basically you skip a stitch, do a treble into the next two stitches and then do a treble into the stitch you skipped. That creates the single cross stitch. You repeat this across the square. The first row is the cross stitch and the second row is a basic crochet stitch. Note that this is not two stitches creating a cross but one stitch crossing over in front of the two stitches you just did. Simple. 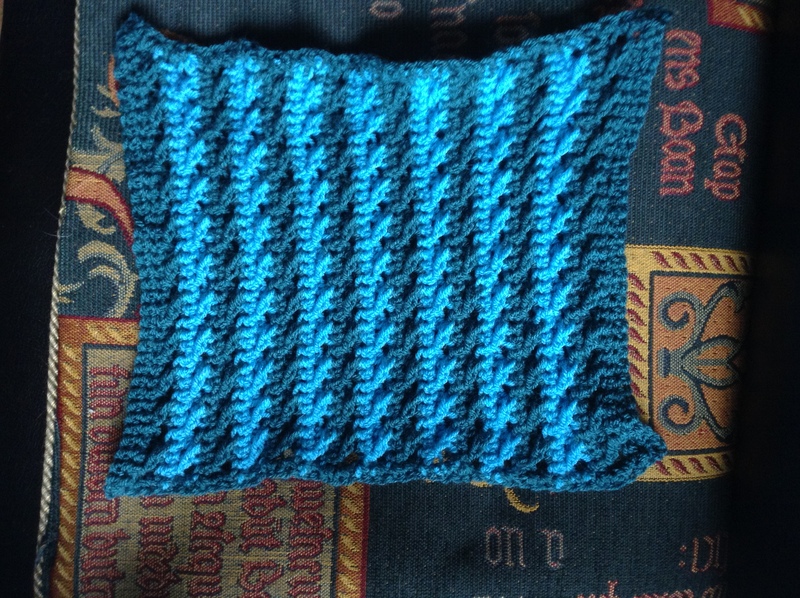 I first did this in a single colour, but for my second square I alternated my colours every two rows. Alternating the colours made it easier to see where you were in the pattern, but between me and you sewing all those ends in is not something I enjoy. There is a reason I never took up sewing.